Faceboook.com is the domain to have (count the 'o's) if typo squatting is your game. That's because Faceboook.com is the most popular mistyped entry into a browser URL bar, according to data collected and analyzed by Chris Finke from his browser add-on, URL Fixer. Of course people intended to go to Facebook.com. But when visitors find themselves at Faceboook.com they are told they've won some sort of contest for Facebook users. That's a lot of lucky Faceboook winners, I can only guess. 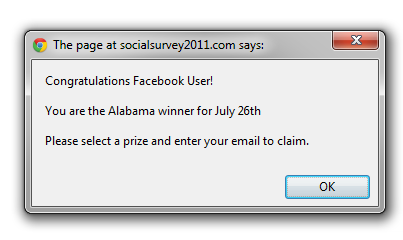 Those who enter Faceboook.com are directed toward this contest. Finke's analysis of more 7.5 million URL bar inputs also reveals that Facebook.com is by far the most typed address, three times more popular than the #2 address, google.com. Of course, according to Alexa and most other sites that keep a public list of the most popular domains online, Google is still the number one destination. This is likely because many people are getting to Google via the search bar or typing a search query directly in to the address bar, rather than actually entering Google.com. Yahoo! 's toolbar also explains why it is only the seventh most popular typed-in URL, despite being a top-five domain. This logic doesn't hold up for Twitter.com, in a tie for the fourth-most popular typed-in domain with gmail.com, because I would have thought that very few users are actually accessing Twitter via its website these days, given the plethora of Twitter clients out there. Rounding out the top 10 typed domains are Youtube.com, tied for second, mail.google.com at sixth, Hotmail.com tied with Yahoo, amazon.com in ninth and reddit.com is the tenth-most popular typed domain. Finke also found that the top 10 typed domains make up 20 percent of all typed domain entries. Google and Facebook dominate the most-popular typed domains worldwide. The only countries included in the data set where one of the two companies don't control the most popular domain are Russia, Finland, Korea and China. Another interesting note from the data is the slow death of the "www" prefix. Finke found slightly more than half of all URL entries did not include it. As for other mistyped entries, googe.com and goole.com occur most commonly behind the aforementioned phishing expedition that is faceboook.com. Fortunately, we seem to be pretty adept at our URL typing, as we only end up at that scam site once for every 7,390 times the correct Facebook address is typed in the URL bar.